Please contact our store, (402) 472-3471 for availability of your area of interest prior to purchasing images on-line. 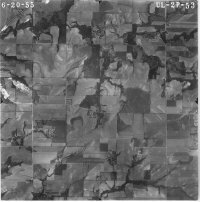 The Nebraska Maps & More Store houses the largest public archive of historical Nebraska aerial photos in the state. The photos were obtained from the collection of the United States Department of Agriculture’s (USDA) Farm Service Agency (FSA). The USDA was established by Abraham Lincoln in 1862. The 1st modern farm program, the Agricultural Adjustment Act was created in 1933 to cope with the effects of the great depression. The archive is cataloged by county and indexes are available for each county. The archive includes photos from the 1930s to the 1970s and generally includes one set of photos for each decade. Photos of interest can be located using legal descriptions that include Township, Section and Range but can also be found using a description of the location noting landmarks, towns or roads. The store staff will assist you in locating your area of interest and give you instruction on how to use the index maps. Each photo is approximately 1:20,000 in scale, and is 9" x 9" in size. Store staff will research your location and notify you which photos are available for your area of interest, reproductions of the photos are $14.00 and will be delivered to you electronically, on cd-rom or printed (select one or all delivery method for only one charge). You can also come to our store and research your own locations, when you do the research the photos are $5.00 each for the reproductions and can be delivered in the same formats as above. The public archive is open Monday – Friday, 8:00 am – 5:00 pm (closed over lunch hour from 12 - 1) at 101 Hardin Hall, Lincoln, NE on the University of Nebraska – Lincoln East Campus at the corner of 33rd & Holdrege Streets. 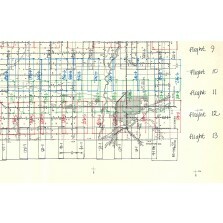 In 1940, the aerial photography labs were created to support this program. They were first located in Washington, DC before moving to Salt Lake City, Utah and Asheville, NC. In 1976, they were consolidated into one location in Salt Lake City. 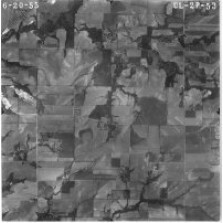 Multiple sets of the imagery were created and the University of Nebraska – Lincoln’s Conservation & Survey Division (CSD) acquired a nearly complete set for Nebraska. CSD makes this archive available to the public through its map and publication store. Photos can also be obtained by contacting the Aerial Photography Field Office in Salt Lake City, UT.